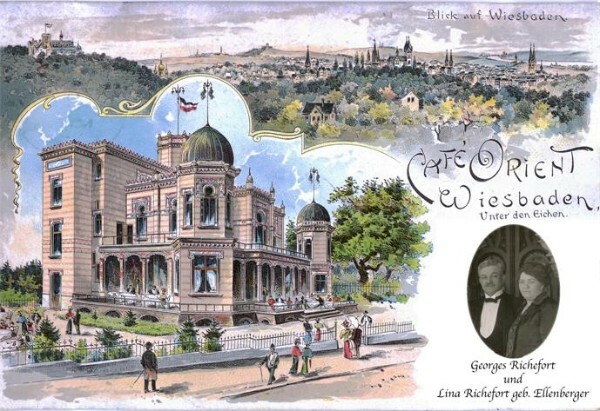 When Alfred Georgi, the former chef at court of the German emperor, Wilhelm II., established the "Café Orient" (location "Unter den Eichen") around the turn of the century (1900) and it quickly became on of the favourite meeting places of the Wiesbaden society. The known Wiesbaden architect Carl Dormann had designed a Moorish facade fot the cafe. Spiked arcades shaped like horseshoes and donkey backs, three mosque-like cupolas and many small towers, blue underlaid oriental decorations with striped Dutch clinker and large-scale stalactite cornices and ledges gave the building an Islamic appearance. This impression became reinforced through the more than lavish interior equipment and decoration. In 1914 the hotel professional Georges Richefort from de Alsace region leases this bizarre-elegant house and later he bought it. New the cafe experienced its heyday. Therefore Richefort applied for a permit to build an additional ballroom for a thousand (!) people. But then – the world recession. Richefort had to file a bankruptcy petition in 1929. The "Café Orient" was closed temporarily and later it was carried on by others. The building was not damaged during The Second World War. Inspite of this, the building was demolished in 1964 to make room for a multistory apartment house.